It was also a historic day for Armenian LGBT rights movement. 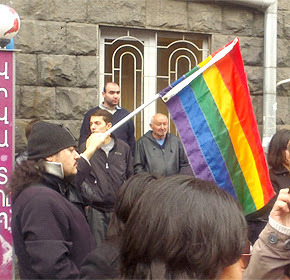 A well known brave activist Lala Aslikyan brought a rainbow flag, symbol of LGBT rights movement, to the protest march. Big respects, Lala !! 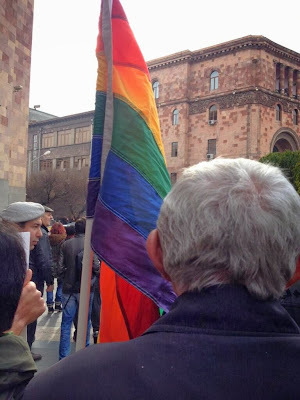 She made history today by holding rainbow flag during a protest action in Armenia. For the first time ever. 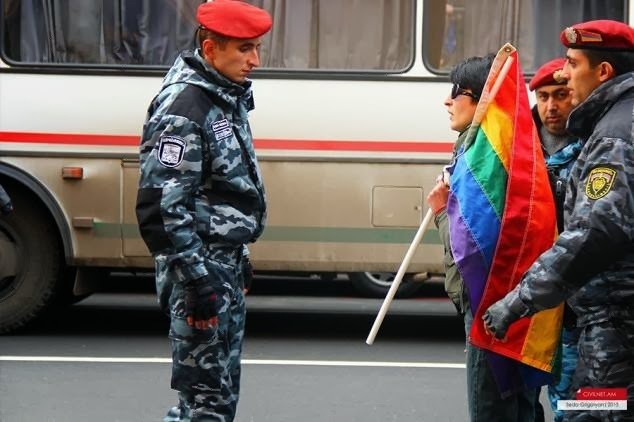 After the march she was followed by police and detained along with other fellow activists, although there is no indication that they were detained because of holding rainbow flag, but rather as part of a massive crackdown on all anti-regime, anti-Putin activists. They were later released. 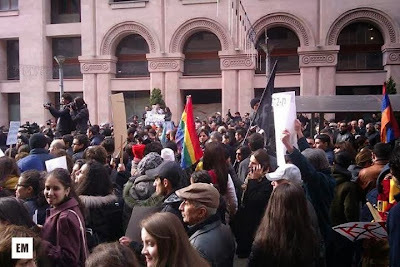 But apart from being forcibly taken away and detained by police, holding rainbow flag didn’t pass without an incident. Lala (and friend) bravely defended her right, as a free citizen, to march with the flag she prefers, saying that no one can interfere with her decision and she will hold the flag regardless of any hostility. Activists were successful in defending the flag. It remained with them without being torn down or taken away. Remember this date: 2 December 2013. This was the first time ever in Armenian history that a rainbow flag was held at a protest action. Interestingly, that particular flag has a history of its own. It was used in Genocide memorial day protests in front of the Turkish Embassy in Paris for several years in 2000s. Of course, the appearance of rainbow flag will be exploited by pro-Russian forces who are full of scare mongering tactics, equalling EU with being gay. But hey, they have been doing that for months now, regardless of rainbow flag appearance. Indeed, it is very relevant to have rainbow flag during any protest action against Putin, taking into account his anti-gay policies in Russia and their influence on surrounding post-Soviet countries. "За вашу и нашу свободу”.